The newcommers from Australia which like Deströyer 666, Abominator and Bestial Warlust are called Hellspawn. This band is formed by members from bands like Damaged or Order Of Chaos are playing blasting Black Metal. 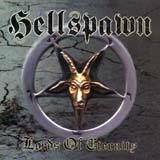 Far from Scandinavia, Hellspawn refreshes the Black Metal scene either with atmospheric breaks or by adding brutal death elements aslike their dutch collegues from God Dethroned. Lords Of Eternity is a very good debut album with the typical ingredients from the Black Metal scene like fast (but melodic) songs like The Whores Of Udramalech and Recuratul Refarious, but also atmospheric keyboards specially on the magnificent break from Baphomet's Disciples. The force of the album is a combination of speed, atmospheric and Death Metal elements with complex arrangements. Spawn the drummer makes a festival of hammering double- bass drum mayhem during this album. Hellspawn respects the bases of the Scandinavian scene and brings out an interesting and various debut album.